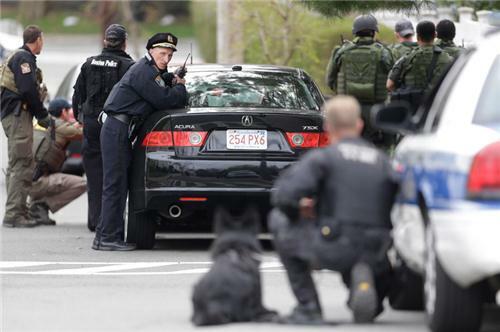 Live updates on the hunt for the Boston Marathon bombing suspects. 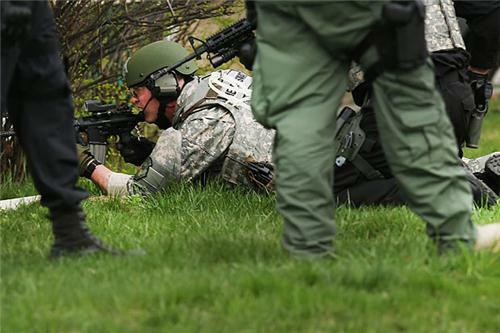 Police officers take cover as they conduct a search for a suspect in the Boston Marathon bombings in Watertown, Mass. (Matt Rourke/AP). According to CBS, Dzhokhar Tsarnaev entered the U.S. on a tourist visa in April 2002, and sought asylum in September. 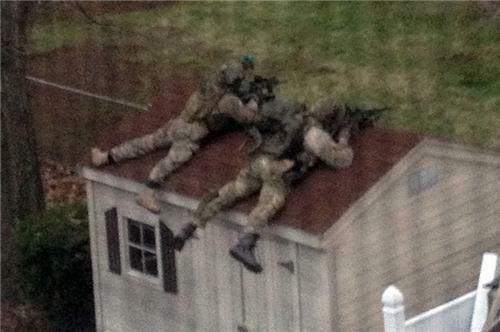 So law enforcement admits they have not apprehended the second suspect, but continue to search Watertown. And they announce there will be a "controlled explosion" in Cambridge, at the home of the alleged bombers. Govt official says younger Chechen became US citizen last year and the older was in the middle of the process. Crowdfunding has raised more than $1 million for victims of the Boston Marathon bombing according to CNN. UPDATE: All #Amtrak service is suspended NY to Boston indefinitely. Trains are currently operating as scheduled DC - NY. Pete Williams explains tight security in Boston indicative of officials believing the "marathon bombing the work of more than just 2 people"
This photo shot through a window screen shows police in tactical gear in Watertown, Mass., as they search for a suspect at large in the Boston Marathon bombings (Samantha England/AP). Some Cambridge residents now reporting loss of power via social media. "If you are at work we do not expect you to shelter in place and stay there, we encourage you to leave, get in your cars and drive home," says law enforcement official at briefing. He says taxis are available, but not public transportation. You can call your friends to come pick you up in a car, says EMS director in Watertown. NBC reporter on the ground in Watertown says scene has toned down, looks like they do not have the second suspect holed up as they had hoped. 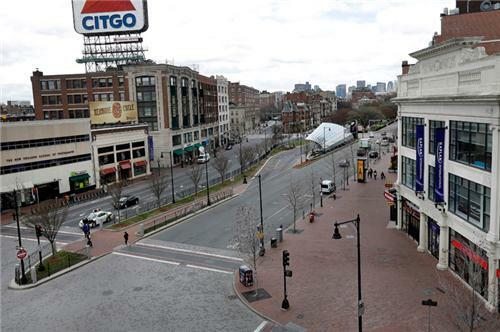 The usually busy Kenmore Square in Boston is virtually deserted at lunchtime during a call to "shelter-in-place" in Massachusetts (Elise Amendola/AP). CIA Director John Brennan just arrived at White House. He was on video link w/POTUS during situation room Boston briefing early this a.m.
"The manhunt is now down to one person - the younger brother," says NBC's Richard Esposito. "They are hoping, they say, he is somewhere nearby." "They have ruled out that there is a third person," Esposito adds. "The good news is there are more bomb sniffing dogs in Boston right now that reporters," NBC analyst. 4:00 PM #MBTA UPDATE: Service on ALL MODES remains SUSPENDED. Please continue to check this account and MBTA.com. "We were terrified that we were going to die," says a Cambridge shootout witness to CNN, who just described holding his wife while the 20 to 60 bullets were fired, knowing he couldn't protect her. "We were just powerless." "I think they were going to go down fighting," says Rep. Pete King, R-NY, noting volume of explosives found. South Boston Boxing Club pres. Tom Lee said Tamerlan Tsarnaev trained at gym in 2010: es.pn/11oYaaX Called him a "gifted athlete"
Members of a police SWAT team search through a neighborhood in Watertown, Mass., as Boston Marathon bombing suspect Dzhokhar A. Tsarnaev remains at large.